Card trick. Pick one of the cards. 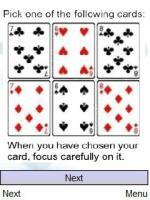 When you have chosen your card, focus carefully on it and keep it clearly in your mind for 15 seconds. Look at dog's eyes. Your card has been removed! Trick Your Friends!